Tile is one of the most favorite design materials for both kitchen renovation and bathroom renovation. It has been used since Roman times, and even though excellent man-made materials have become popular in recent years, tile is still valued for its beauty and cost-saving potential. All tile can be classed into four main types: ceramic/porcelain, glass, quarry, and stone. Best for low-cost surfacing with an almost infinite choice of styles, when we talk about tile being cost-effective, we are talking about ceramic tile. While not all ceramic tile is cheap, it is possible to find bargain ceramic tile which still can add to the beauty of your home. Ceramic tile starts with clay—shale, gypsum, and sand—and is worked into a material called bisque. The bisque is shaped into tiles and is fired in a kiln up to 2500° F. The higher the temperature, the stronger the tile will be. By its very nature, ceramic tile is porous. So a glaze must be applied to the tile and then the tile is fired again to harden the glaze. Sometimes, the glaze is applied before the bisque is fired for the first time. So the main value of ceramic tile, besides its possible cost-savings, is that it can be formed into an infinite variety of colors and shapes because it is made from scratch. Porcelain is a variety of ceramic tile that is certified by The Porcelain Tile Certification Agency (PTCA) as being either porcelain or not. According to the PTCA, porcelain must meet ASTM C373, a higher standard of water absorption than ceramic that is not designated as being "porcelain." Thus, porcelain is a better candidate for high moisture areas like next to bathtubs and showers. Best for creating showy, flashy, fun vertical surfaces, glass mosaic, often associated with design trends of the early 2000s, still holds firm as the tile of choice for limited vertical surfaces that get lots of attention. It is commonly used for kitchen and bathroom backsplashes. 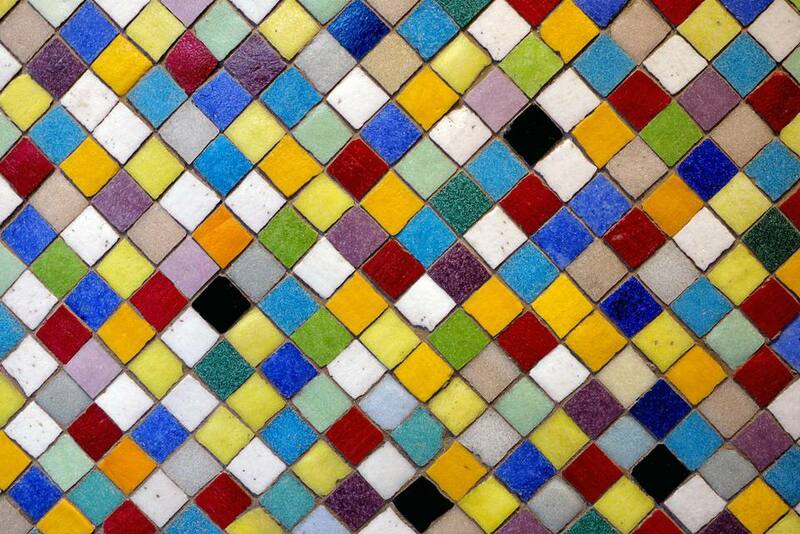 Because it cracks under pressure, glass mosaic is not appropriate for floors. Most mosaic glass comes attached to a web backing that allows you to install one square foot at a time. Glass tile has a sparkling, lustrous beauty that cannot be matched in other types of tile materials. Best for outdoor flooring and indoor floorings such as foyers and hallways, in the past, quarry tile came from quarries. Just like you see in old photographs of Vermont quarries, the tile was cut away, ground, and polished. But now manufacturers use the extrusion method for making a vitreous clay tile that is almost as hard as natural stone. Quarry tile has a rough surface, which means that it is perfect for flooring because it provides a good grip. But it also means that quarry tile is not good for kitchen countertops because it is very porous. However, even though quarry tile can be sealed to make it less porous, it is still not appropriate for food preparation surfaces. Best for kitchens and bathrooms. In recent years, granite has become the big winner in the kitchen design sweepstakes. It should be noted, though, that granite looks great but it does have its problems. Granite easily cracks, and like quarry tile it is porous, so it must be sealed and polished on a regular basis. Not only that, granite and marble are easily scratched and are not always resistant to high temperatures such as those from hot kitchen pots. Still, the variegated coloring and texture of natural stone cannot be duplicated by ceramic tile. It is endlessly fascinating and provides unique design accents for your house. So, despite natural stone’s shortcomings, it still wins out from a design perspective. Natural stone can be inhospitable to bare feet when used in bathrooms. This is why installation of radiant heating mats under the stone is highly recommended for bathrooms.